Home>Oils and lubricants>Lubrication and greasing>Oils and fats>Multi-functional grease>Fat Maxigras 593 spray 520 c. c.
Fat very fluid light-colored, specially formulated for the lubrication of chains subject to high impact and adverse weather conditions (water, snow, dust, mud, etc). 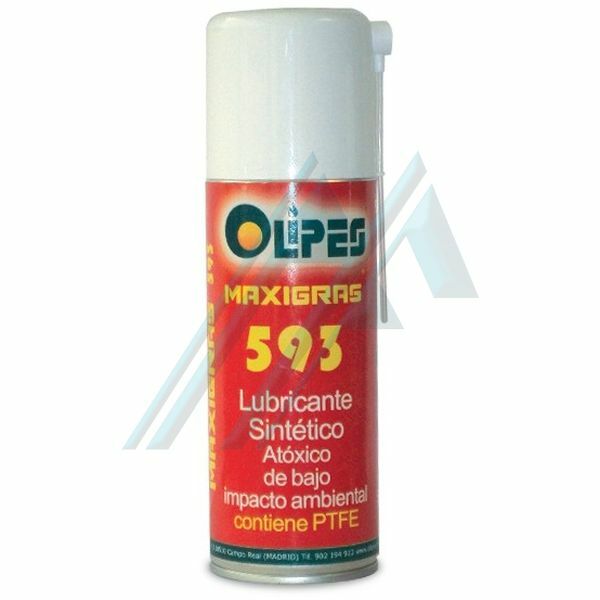 Its fluidity facilitates the application and penetration in inaccessible areas and because of its fast drying ensures an anchor perfect in the areas lubricated. High power anti-corrosive, antioxidant and anti-wear. Its fat components will ensure a great unctuousness. Its content of PTFE ensures the film formation of stable and long-lasting. Resistant to high pressures and the aggressiveness of a large number of chemicals. Compatible with all types of rubbers, seals, elastomers and paints. High protection anti - dust. Temperature application from -35ºC to + 150ºC. Flammable product, do not spray near flames or sources of ignition. Spray of 520 c. c. in boxes of 12 units. Call for availability of other packaging manufactured to order.